The Captur is Renault’s entry to the increasingly popular small crossover market. The 1.5-litre diesel we tested promises excellent fuel economy and low emissions. However, its legal towing limit is just 900kg, so it’s strictly for lightweight caravans. We’re expecting the Captur to pull a lightweight van well, with strong stability at speed. But, can an engine that focuses on fuel efficiency, rather than power, produce enough poke for towing? Read on to find out. 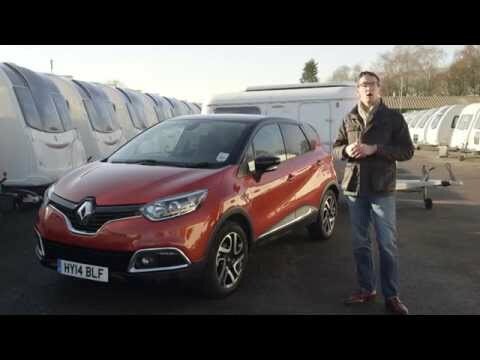 So, what tow car ability does the Renault Captur have? Well, you’ll need to match it to a very light caravan, a folding camper or even a trailer tent. The lowly 900kg towing limit sees to that. We hitched the Renault to an Eriba Touring GT, which has a maximum laden weight bang on the Captur’s towing limit, and an unladen weight of 720kg. Even when pulling a small tourer, acceleration is steady at best. It took the Renault Captur 17.6 seconds to tow the Eriba from 30-60mph. As long as you don’t mind the pace, you’ll find this car to be on the right side of underpowered. The engine’s peak torque of 162lb ft is modest, but it’s delivered from just 1750rpm. This will spare you the frequent gear changes that other small tugs need to hold their speed. If the road climbs steeply, however, you must use a heavy right foot. Once up to speed, the Captur is relaxing to tow with. Plenty of light tow cars feel unsettled, but the Captur is stable and unflustered on the motorway. In an emergency manoeuvre, the Renault grips well and changes direction promptly. The light and rubbery steering doesn’t inspire confidence, but trust the car and it keeps the caravan in check when pushed hard. Stopping the outfit from 30mph took 11.2m on a damp track. That’s acceptable, given the slippery surface. In regular towing, the brakes were easy to apply smoothly. The handbrake was put to the test holding the car and caravan still on a 1-in-10 slope. It needed a firm pull to prevent them from rolling backwards, but it did hold. The Captur then pulled away without complaint or wheelspin. There’s no getting away from the low towing limit, but we’re judging the Captur as a tug for lightweights. If that’s the type of tourer you own, the Renault gives a good account of itself. For a car with modest power and torque, the Renault Captur performs well enough. You could never call it quick, but it accelerates at a respectable rate. The diesel engine is refined, too, only becoming intrusive when revved hard. Wind and road noise are kept in check at speed. You can hear the odd thump from the rear suspension, but the ride is comfortable over all but the worst roads. Whether dodging urban potholes, dealing with rough country roads, or smoothing over motorway imperfections, the Captur’s suspension does a good job. It’s not big, but the Captur makes the most of its size to offer reasonable space. Anyone in front should be comfortable, but the flat seats offer little support in corners. It’s a shame the dashboard isn’t better finished: the plastics are hard and shiny, making the Peugeot 2008’s feel more upmarket. However, the cabin is attractive, with splashes of colour and a large and easy- to-use touchscreen. Those on the rear bench can slide it all the way back to get more space. This feature also allows you to extend the boot, assuming your passengers don’t mind losing some legroom. Despite having three belts, the seat is better suited to two people in the back. The boot has a minimum 377-litre capacity. That’s comparable with the space in the Volkswagen Golf and other pricier hatchbacks. The Renault Captur makes a sensible buy. It’s reasonably priced and, according to research by our sister magazine What Car?, discounts of over £1500 are available if you haggle hard. Sell the car on after three years and 36,000 miles and you should be able to get back 45% of the original price. In addition to the official fuel economy figure of 76.4mpg, we achieved 38.8mpg when towing. This and its low insurance group will make it inexpensive to run. The Captur has achieved a five-star rating from the safety experts at Euro NCAP, too. This appealing small car is practical, looks good and should cost peanuts to run. The towing limit is its biggest problem, putting it out of the running for owners of full-size tourers. As a tug for an Eriba, a T@B and other lightweights, though, the Renault Captur is well suited.